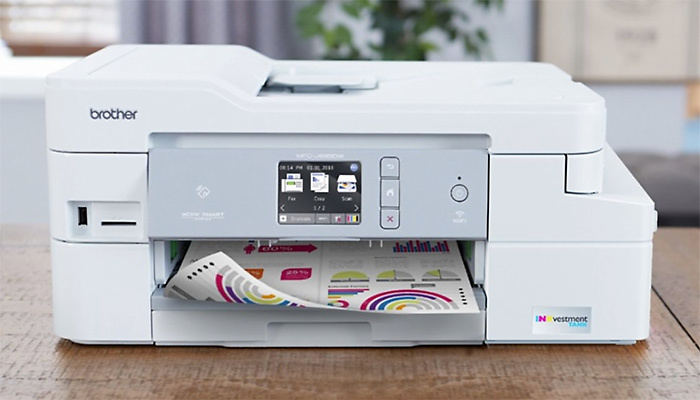 With a white colored exterior instead of the traditional black, the J995DW looks like a typical all-in-one inkjet printer, until you notice the protrusion on the right side of the machine. The design is to accommodate four, newly developed high-yield ink cartridges (black, cyan, magenta, and yellow) that don’t have traditional mechanisms, like levers and springs. The one-year claim is based on average monthly print volumes of 150 pages, at 60-percent black and 40-percent color. If you print occasionally or you print mostly in draft mode, you’re likely to hit the one-year mark or possibly longer, But if you print a lot of colorful documents, chances are you’ll have to replace the ink before the year is up. The J995DW adds new features to the INKvestment series, including fax; support for additional connectivity services; has a higher max monthly duty cycle; and a larger-capacity paper tray. Like its predecessors, there’s a 2.7-inch color touchscreen, support for popular cloud services (Google Drive, Dropbox, and Evernote) and mobile printing (AirPrint, Google Cloud Print, Mopria, NFC), duplex printing, and other features designed for small or home office use. The J995DW isn’t positioned as a photo printer, but does do a very good job with printing color on photo paper. This entry was posted on Tuesday, July 17th, 2018 at 9:38 am	and is filed under Brother, inkjet, multifunction, printer. "Zebra’s 2 New Barcode Printers For Healthcare"